As a retailer, doing physical counts of inventory probably isn’t on your list of favorite things to do. A tedious task, taking count of store merchandise can take hours, and for some merchants, it also requires closing the store temporarily. But even if it’s a job that you’re not too fond of, taking a physical count of inventory is a must for any retailer. Keeping a close eye on the stock you have on paper vs. what’s actually in-store enables you to maintain inventory accuracy, spot causes of shrinkage early, and ensure that you always have the right amount of stock at the right time. Don’t have time to read this article? Subscribe to our newsletter to get the PDF version and learn how you can streamline physical inventory counts in your business. Have you ever tried cycle counting (aka partial stock-takes)? It’s the process of partially counting merchandise on a continuous basis so you can monitor stock levels without interrupting store hours. 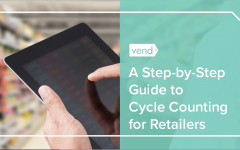 Known as one of the most efficient inventory counting methods for retailers, cycle counting can be done daily or weekly (usually before the store opens) and can free you from having to do full inventory counts. Philip Pravda of SuitCafe.com highly recommends this method. “I owned four luxury menswear shops, and my method for taking physical inventory was almost daily,” he shares. Similarly, Preston Wily of ecommerce site SewellDirect.com says that conducting partial inventory counts on a continuous basis has worked well for them. Traditionally, physical inventory counts are done with a pen and paper. The staff would use a physical inventory count sheet to tally up the products and reconcile the data in their system. While this method can get the job done, it’s highly inefficient and it requires double entry. Not to mention, since physically counting inventory is already a “manual” task as it is, the last thing you need is to manually tally and record data. If you’re using a POS or inventory management software, check to see if it offers inventory counting features you can use. 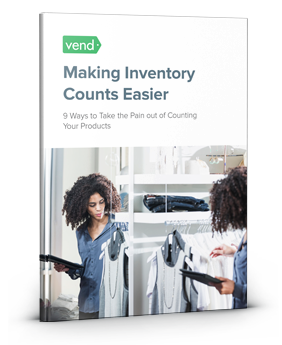 Vend’s Inventory Counts capability, for example, enables retailers to take count of their stock as painlessly as possible. Features like simultaneous stocktakes allow the use of multiple devices to count stock faster, and Vend’s quick scan mode function enables retailers to count inventory by using their barcode scanner or by looking up SKUs. 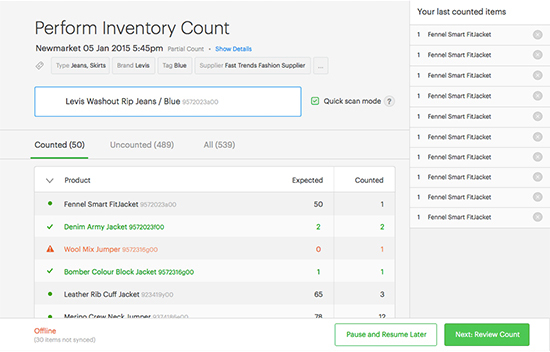 If you’re already using Vend, check out our new stock taking features and take advantage of them the next time you’re conducting physical inventory counts in your stores. Scanner app – Digitize the counting process with Scanner, a free mobile app that makes counting inventory a breeze. Scanner lets you do full and partial inventory counts using your iPhone, iPad, or iPod Touch. Just scan your product barcodes using your device’s camera, and the app will automatically save and record all the necessary product information. Scanner also syncs completed counts with your Vend account, so once you’re done counting, you can easily update your stock levels. 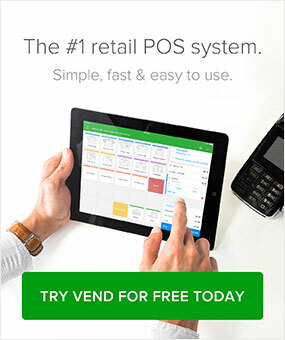 Not a Vend user? Scanner will create a CSV file that you can easily email to you and your staff. Save time and reduce human error when conducting your stock counts. Click the link to learn more about Scanner, the free barcode scanner app for inventory. RFID – Need a more sophisticated tool for inventory counts? Consider RFID technology. Short for Radio Frequency Identification, RFID lets you embed chips into the packaging of your merchandise so you can easily track their location. RFID is really handy, not just from a loss prevention perspective, but also when it comes to maintaining inventory accuracy. Consider what Mammoth, a sporting goods store in California, does to streamline inventory counts. Instead of doing full inventory counts, the company physically counts its high-ticket, high-shrink items daily and then cycle counts through a percentage of its stock with the goal of counting all its merchandise every two weeks. Mammoth also uses Truecount RFID software to generate reports of what they have should have on in stock. “Truecount lets us create a comparison report based on what our computerized inventory system says we have in stock and what we can count,” Mammoth co-owner Phil Hertzog told the NRF. This task is performed after closing, and they reconcile their inventory the following morning to look for discrepancies. If there are any differences, Truecount software tells the staff where the missing items should be so the location can be physically checked. Don’t assign your inventory counts to just any employee. The group conducting your stock counts should consist of seasoned employees as well as those who can provide fresh eyes. You’ll need seasoned team members, as these employees would be more familiar with your policies and the location of different items. However, someone who’s so used to your store or stockroom may overlook small issues and details, so having people who are a bit new to the team may be beneficial. Another option is to hire third-party inventory counters. This is helpful if you don’t have the in-house expertise or resources for conducting the count yourself. Now, the actual counting procedure will vary from one provider to the next. It’s best to consult with your third-party stock counter and follow their processes. The timing of your inventory counting process matters a great deal, so have a think about when (and what time) to schedule your counts, and then plan (way) ahead. When is a physical inventory usually taken? The question of when (and how often) you should conduct full physical inventory counts really depends on you. Some stores do it once a year, others conduct it on a bi-annual basis, while other stores do it more often. The Retail Doctor, Bob Phibbs, writes on his blog that it’s best to do it on the last weekend of January or at the end of July because your SKUs are potentially at their lowest during these periods. Whatever you decide, though, you’ll want to settle on a date well in advance (weeks or even months before) and make sure your employees know what’s coming up. At this stage, you need to take down the names of the people who’ll be helping you with your physical inventory count. Make sure they can make themselves available on the decided date. Ideally, you wouldn’t want to halt store operations, so if you can manage it, schedule your inventory count after business hours. But if this isn’t possible, and you’ll need to close up shop for a day or several hours, be sure to give your customers a heads up. 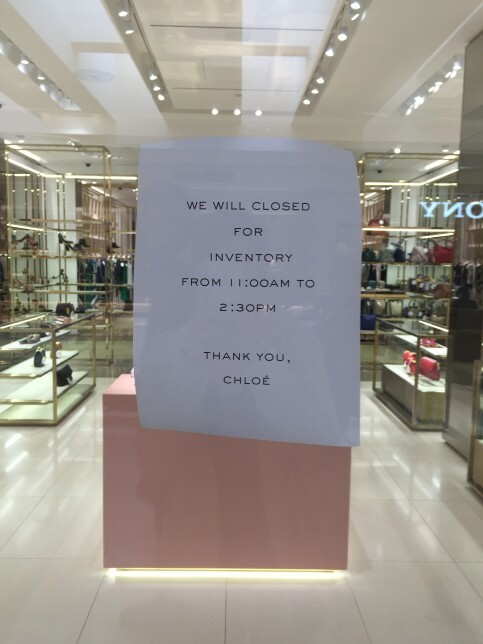 Alert regulars that you’ll be closed on a certain date, verbally inform people when they’re in your shop, and display a sign outside your store or at the checkout counter detailing the date and times you’ll be closed and why. Doing so will give an at-a-glance view of your store and make it easier for you to assign people to each section so you can determine the best way to go about the counting process (i.e. where to start counting, how to move around the store). 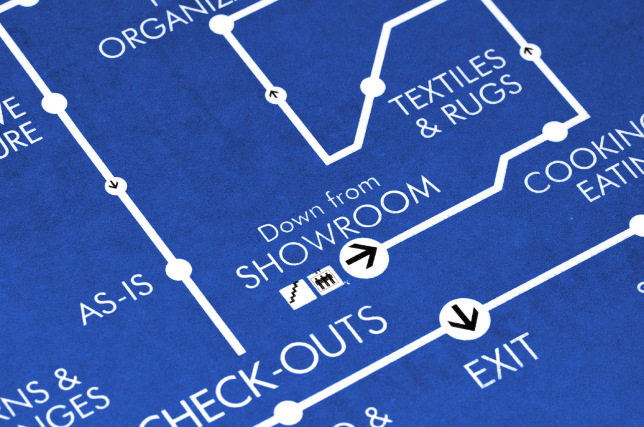 Your map can also serve as a handy checklist when you’re actually counting products. You can mark off the sections that have already been counted, making it easier to see how much you’ve completed. Don’t go into the task blind. If you’re doing a physical count of your inventory, be sure to mark the boxes or shelves in your stockroom if the products in them aren’t visible. While you’re at it, make sure everything is where it should be. Walk around the store or stockroom and keep an eye out for items that aren’t in their proper place. Are there tank tops lurking in footwear section? Did someone mislabel a box of merchandise? Be sure to correct these issues before you begin counting. When planning your inventory counts, figure out how you’re going to deal with things that are in limbo. These could include merchandise in transit — such as outstanding orders from suppliers or products that have been returned. Ideally, these items should be processed and dealt with before performing the count to avoid any confusion later on. Ditto for faulty products. If you encounter damaged items before the count takes place, deal with them early on. See to it that your team is familiar with all of the steps you took above. If you created a map, show it to them and ensure they know where people are assigned. Did you change the position of certain items or re-labeled boxes and sections? Tell them—or better yet, show them. Take a walk with them on the sales floor or stock room so they can familiarize themselves with everything. This will make the task of actually counting and reconciling much easier. Water, sodas, and a few boxes of pizza will go a long way in keeping your employees happy and efficient. Physically counting inventory is a tedious process, so you want your team to stay on top of their game. Keeping them well-fed and watered helps them do just that. Double-check and audit your counts ASAP – It’s always a good idea to double-check your inventory numbers before updating your stock levels, to make sure everything was counted correctly. And the time to do this is right after you complete your inventory count. The information needs to be fresh in your mind, so avoid postponing your inventory checks and audits. Pull up inventory reports – Doing so will enable you to analyze the data and see what you can do to improve your business. This task should be straightforward if your POS or retail management system has reporting and retail analytics capabilities. Just generate the right reports and study the data for actionable insights. Alternatively, you can use a tool like Vend’s free Excel Inventory Template to gain the data and insights you need. Pinpoint high-risk zones – Use your inventory reports to identify high-risk zones or regions in your stores. Tell your staff about these high-risk areas and figure out how you can minimize losses in those regions. Compare multiple completed inventory count reports – Once you’ve completed multiple counts over a period of time, it’s beneficial to examine those reports so you can spot patterns. This will help you figure out why losses or discrepancies are taking place, so you can take preventive action for the future. If you encounter discrepancies take immediate action to get to the root of the issues. As we mentioned in our post on inventory reconciliation, discrepancies can often be traced back to human error, bad math, or missing paperwork. In such cases, you’ll need to tighten up your processes. Document your procedures and automate various steps to minimize mistakes. For instance, if you’re manually entering products into your system, use a barcode scanner or CSV file instead. Sometimes, inventory discrepancies are caused by more sinister reasons. You could be dealing with theft or fraud in your store, in which case you’ll have to investigate and take steps to prevent and stop the issues. Whatever the case, the only way to determine what you’re dealing with is to conduct inventory counts regularly, so make it a point to stay on top of this task. 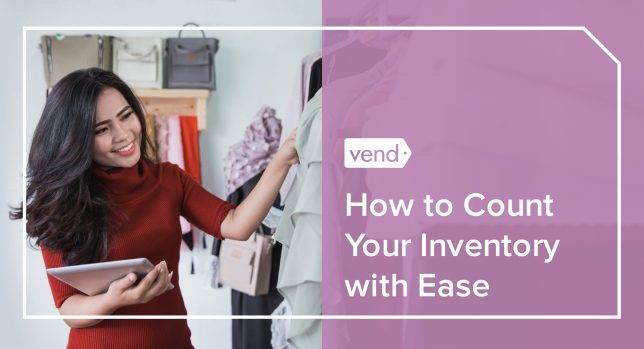 Whether you’re handling inventory management using Excel or are using a retail solution like Vend, stock-taking is a critical part of a running a retail store. Smooth and painless stocktakes don’t happen by accident. Details are planned well in advance and the products, materials, and tools you’ll be using are prepared beforehand. If you intend to do physical inventory counts anytime soon, be sure to complete the tasks we talked about above. Doing so will make your life so much easier. Got any other tips for doing physical inventory? Let us know in the comments. A strong recommendation for most retailers is farm it out to an inventory company. They can do the job (in general) cheaper and faster than associates at the store level. As you noted above, most associates aren’t fond of inventory taking. Get better results with an outside service. Great point, Emery. Hiring a third party that specializes in inventory counts could be a cost-effective and time-saving option for retailers. Have you ever dealt with such services? If so, tell us about your experience with them. In the interest of disclosure, although I have been in retail for 40+ years, my wife owns an inventory service company. Having said that, I used inventory services for the past 25 years throughout the US and would never go back to doing the inventory myself. Certain “bad” inventories stick in your mind and almost all were when we made the decision that we could do it better, faster, cheaper. It was never any of those. Some lasted seemingly forever. There are some inventory companies that are better than others and unfortunately, size doesn’t seem to matter. We have encountered problems with RGIS and WIS (the two largest). It’s more about the local management than anything else. The best advice when shopping for an inventory service – price is important but the service is more important. Check local references. The inventory results can last a long time and can have tragic consequences. 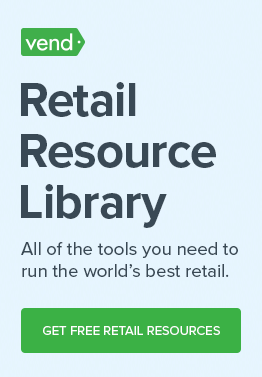 Retailers tend to be very unforgiving of high shrink. Very well-said. Thanks for the advice, Emery! I have worked for both of these big companies, and agree – results can vary. However, one thing I have found in common – store prep is key to a good inventory. If you are doing a SKU inventory, have your staff do prep work for a few days before – make sure every item has a bar code tag, make sure that it is easily accessible (not hidden inside clothing, etc.) And try to have everything neat and straightened out before the inventory team arrives. The easier it is to get to and scan bar codes, the faster and more accurate your inventory will be. One thing to consider is if your products are unusual in any way, then a third party will likely have more trouble counting them. Many products I deal with have non-standard case packs and/or units of measure, so anyone unfamiliar with the inventory usually miscounts it. That’s an interesting point, Alex. Certainly, when it comes to inventory counts, the decision to seek outside help (and who to hire) depends on the specific retailer and their needs. Thanks for the comment and for your great tips! Having spent 16 years in college store retailing I would say that I highly recommend the store conducting inventory in house. I never used an outside company but have heard many horror stories from store managers who did trust this task to an outside company. I found our accuracy to be excellent. Our industry has seasonal down times when it is possible to close the store for 2 days to conduct inventory. I realize in traditional retailing this time commitment is not possible so the appeal of an outside company may be greater. We just love the discussions brought about by this post! Beth, thanks so much for sharing your experience. It’s great that doing inventory in-house has really worked well for you. And it’s good that you pointed out how seasonal downtimes can also affect inventory schedules. It’s very true that retailers should take this into consideration when they’re deciding when, and who should conduct their physical stock counts. In Vend, the only products that can’t be counted are products that have inventory tracking disabled. This is more common in the service industry rather than traditional retail. If inventory tracking is disabled then you are unable to add any inventory against the product, and therefor can never count it.